What if everyday you get up, get dressed and then sit and wait, until a group of men come, point a gun at you and strep you to the chair? 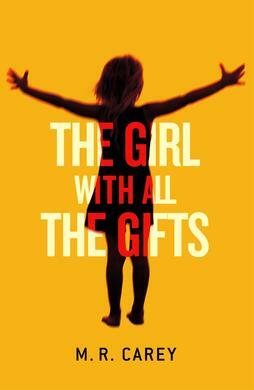 That is the scenario that starts The Girl With All The Gifts by M.R. Carey. Would you wonder why they do it? Or why they never smile at your joke? Melanie is 10 years old and lives this life. This isn’t life! When I read the synopsis for The Girl With All The Gifts I thought it was a science fiction or fantasy novel. At least something with magic and gifted people. Nothing of that sort is true. It is true Melanie is gifted. But not Gifted, as in having a power. This girl only has her brain for power and knowledge. First I wondered what happened to this world that the school Melanie is in was in an army base and she had to be strapped to a chair. But all the questions the book creates for you at the start of the book, it answers. The only problem I had with this book was the end, just before the end there is a plot twist introduced and I am wondering why this was introduced. It came out of nowhere and felt really wrong. Mike Carey wrote the story line pretty well. There is lots of development throughout the story, they don’t stay stuck in the same place. This makes for great changes of pace and kept the book going for me. There was only a small pocket of boredness in the beginning, because one of the scenes on the base just takes a bit too long. But overall I have to say I was not unhappy with this read and enjoyed myself with it – It took me less than two days to read the whole 460 pages. The author really made an effort to make all the characters come alive in your head. Even though the story is about this girl, the story is written from 5 different points of view. Which really helps with understanding who everyone is, what there opinions are and where they stand in this war. All five characters are different because of their background, but also because of their status in the group. I think this was really well done. Usually it is not that deep with secondary characters. I cared for Melanie in the beginning, but as the story progressed, she learns things about her world and by the end of the book I did not like her at all anymore. She lost her innocence to me – which was one of my main thing why I liked her. Her parts were written in a soft way – no harsh language or angry thing. It was really as if a 10 year old had written it – maybe a bit older, but I am 16 years older and can not imagine what I was like back then. She was a smart kid in a world where nobody really cared for her. But she is, in the end, just as bad as the Sergeant. Sergeant Parks, in the beginning of the book, looks to be the villain – or work for the villain. He and his men hold Melanie under shot while they tie her up in her chair and don’t even laugh when she jokingly says she won’t bite – not knowing what she is. But by the end of the book he got my empathy, mainly because you get to know him better throughout the book. The parts written from his point of view are like what you would suspect from a sergeant, to the point and calling things for what they are. I liked this way of thinking and you could immediately see when it was written from his perspective. Helen Justineau was written as a caring person. Her reasoning stayed a bit vague for me but she at least did not make rash decisions and stayed the nicest person throughout the book. The only one really caring for the children in the base. Making sure they are comfortable and treated well. She had my sympathy and did not lose it. I liked that about her. Kieran Gallagher is a young soldier under Sergeant Parks command. He is not as harsh as Parks but helps with the binding of the children. I thought he was part of Parks’ plan or just worked for him. But he also proved to be different from that image. His change over the book was not as dramatic as Sergeant Parks’ or Melanie’s, but he was an intriguing character. The only character I did not get a feeling for was Doctor Cadwell. She is the doctor of the facility, but her actions are all based on her need for proving herself. But even then her actions don’t make sense. She cuts kids up for research, without feeling. Steals a vehicle without any reason. I really did not understand where she was coming from because the reasons she has for herself do not tell me why she is so intense. I think the book could have done with a better character. With the release of the book it was revealed that together with the book a movie had been written. The movie will be called She Who Brings Gifts. On the 23th of March 2015 part of the cast for The Girl With All The Gifts was revealed. The movie will be from Melanie’s point of view and the Junkers have been removed from the movie. Which I think is a great idea, but also make me question how they will then do certain things. This entry was posted in Book Review and tagged Book Review, Dystopia, Fantasy, M.R. Carey, Thriller. Bookmark the permalink.